A Model For Reducing Parental Stress in the NICU. A good idea that is for sure and stress may be what the infant in the picture is displaying as a reflection of what her parents are feeling! A growing trend is to include parents in rounds and that is the subject of this piece? It sounds like a great idea and may feel that way as you have had a personal experience that has been favourable, is the practice in your unit or it just seems to make sense? It might come as a surprise to you who have followed this blog for some time that I would even ask the question but a social media friend of mine Stefan Johansson who runs 99NICU sent an article my way on this topic. Having participated in the FiCare study I realised that I have a bias in this area but was intrigued by the title of the paper. 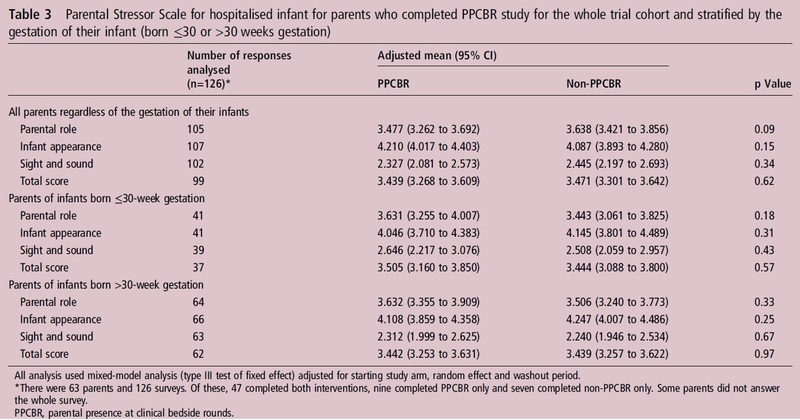 The study is Parental presence on neonatal intensive care unit clinical bedside rounds: randomised trial and focus group discussion by Abdel-Latif ME et al from New Zealand and was performed due to the lack of any RCTs on the subject specifically in the NICU.